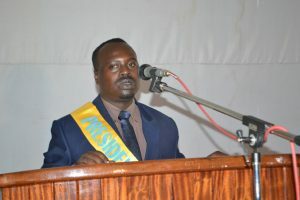 Given the fact that Rwandan intellectuals must shine in the midst of the population by combining science, conscience, strength and deeds to promote the human kind in general and the population in particular, we, students of Kigali Independent University, have created a Student General Association within the University. • Channeling constructive ideals and causing the members to become aware of the problems of the community. o An honorary member is anyone who likes and supports AGEULK and who is approved by the Association General Assembly. • The Executive Committee is composed of: the President and the Spokesman of the Association; the vice-President and Spokesman by proxy; the Secretary General; the Treasurer; the Commissioner to foreign affairs; the Commissioner to the female promotion; the Commissioner to political affairs; the Commissioner to academic affairs; the Commissioner to research, Science and Technology; the Commissioner to information and communication; the Commissioner to sports, leisure and culture; the Commissioner to social affairs; the Commissioner to protocol; the Commissioner to discipline and security. AGULK patrimony stems from: members’ contributions; subsidies from ULK and other institutions; from income generating projects as activities by the Association; from Rwandan Government, etc.